When an Inland Northwest medical packaging company was looking for help in further automating its production lines, it didn’t have to go far. University of Idaho computer science students happened to be studying the practice in downtown Coeur d’Alene and jumped at the chance to help eastern Washington firm Unicep with its automation lines for filling and packaging medical liquids. One Vandal student spent the summer of 2018 working with the company on the project. Amid the hoopla of aspiring technology companies and fast-paced telecommuting, the department that is part of U of I’s College of Engineering has set up shop downtown to better connect its students to the action. The department is one of about 60 tenants in the Innovation Den, the former Coeur d’Alene Elks building at 418 Lakeside Ave. that has been renovated into an incubator of sorts — complete with a coffee shop and barber on the ground floor and multiple conference rooms and public co-work spaces. In between the steel frames, exposed brick and pop art peppering the walls are offices where tech firms are trying to make a go of it and looking to each other for solutions to their logistical questions. 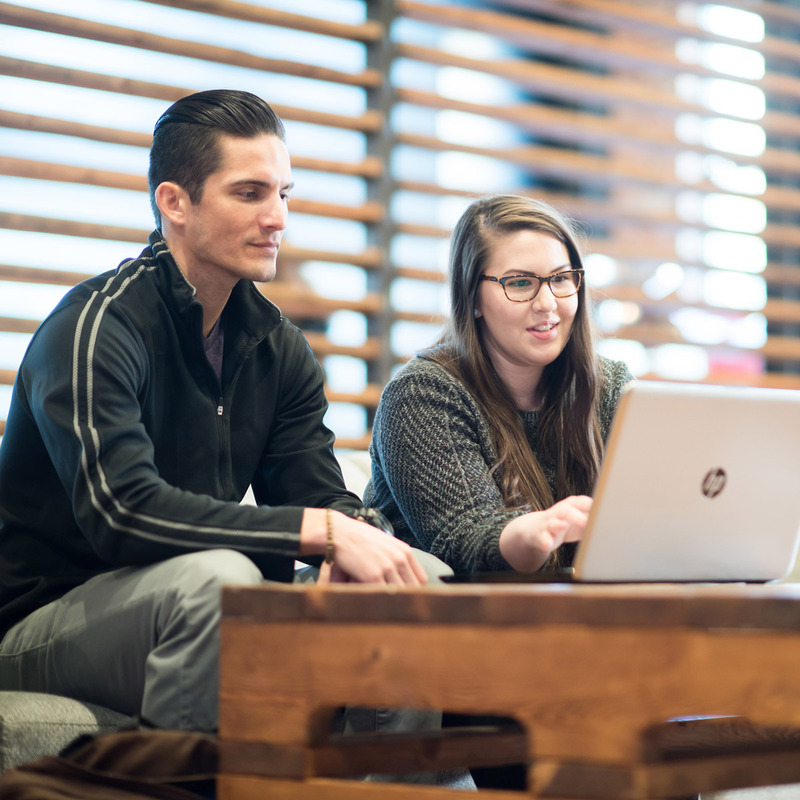 Rinker is one of four faculty members and a handful of staff who moved to the basement of the Innovation Den in September 2017 to better connect students with entrepreneurial companies like Unicep — and potential job opportunities down the road. The Coeur d’Alene computer science program is itself a pipeline of sorts. Students complete their first two years at North Idaho College and the second two years with U of I in downtown Coeur d’Alene. The relatively new partnership is geared to house as many as 50 students in each of the two cohorts who take some classes both in the basement of the downtown location and via video conference from faculty members in Moscow. Adrian Beehner is one of those students. Beehner graduated in May 2018, receiving the first bachelor’s in computer science from the program at the Innovation Den. With tech employees stopping by to ask questions about his projects and brainstorm their own, Beehner said he feels a “whole vibe” in the den that’s different than a typical classroom. He started graduate school this fall in the department’s computer science robotics lab. Beehner’s not the only ambassador. Computer science staff members appoint themselves as tour guides about five times each day as visitors interested in the building and its academics pop inside. The startup atmosphere is familiar for John Shovic, a computer science faculty member at U of I Coeur d’Alene. 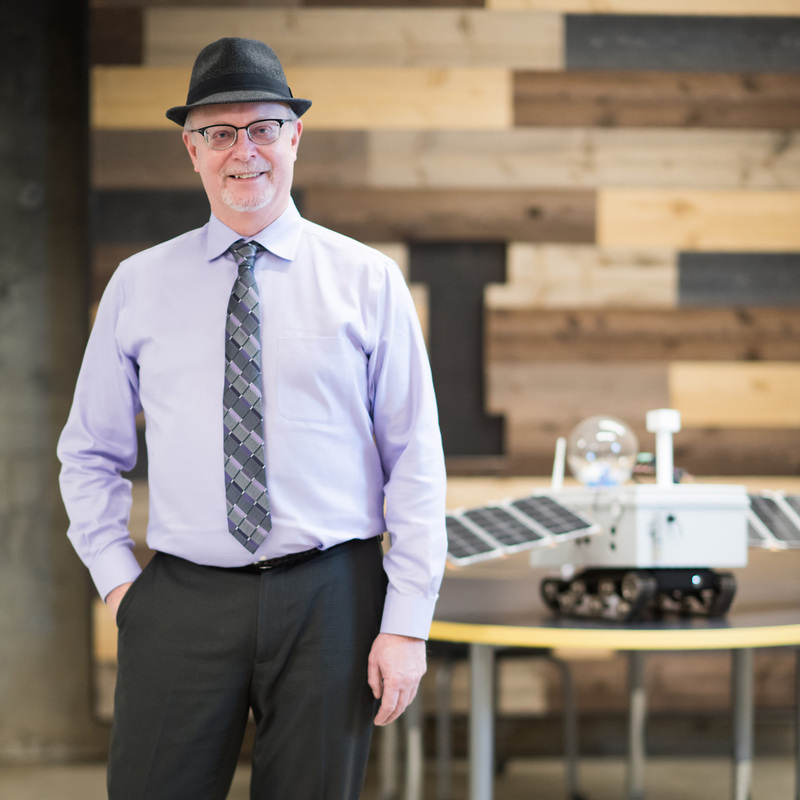 Before his time in the classroom, Shovic spent 25 years in the tech industry and was involved in a few ground-up companies. 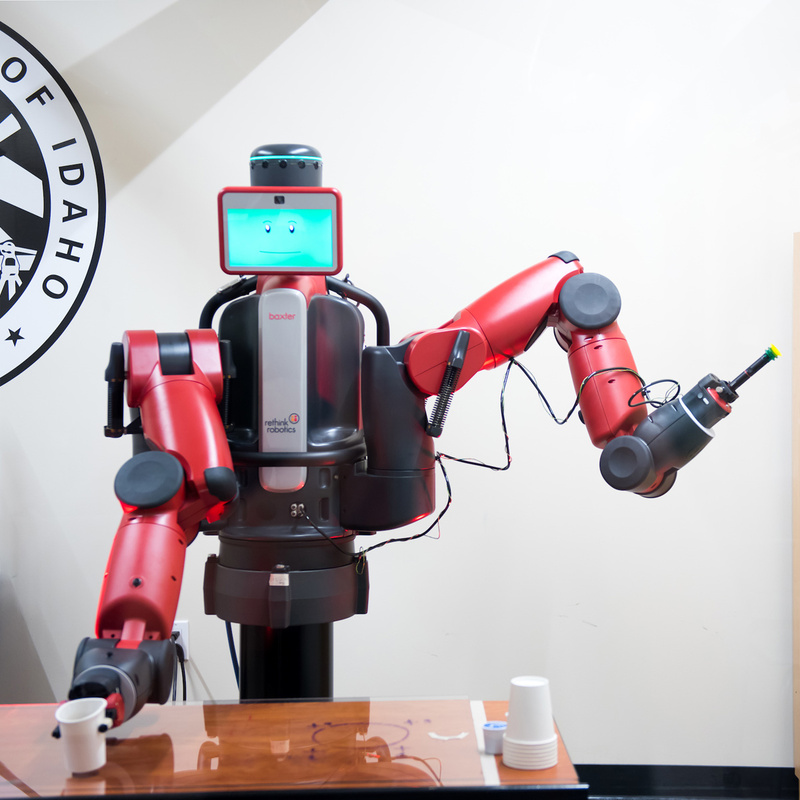 The focus in Coeur d’Alene has been on robotics, including Baxter, a 300-pound red, black and human-sized robot students taught to make coffee last year using a Keurig coffee maker. The cohort’s current venture is Catfish, a small, computer-assisted watercraft that will eventually map and sample the waters beneath North Idaho’s lakes and rivers autonomously. Like a self-driving car, the yellow, push lawnmower-sized submarine will soon take samples and perform research at the bottom of Lake Coeur d’Alene. 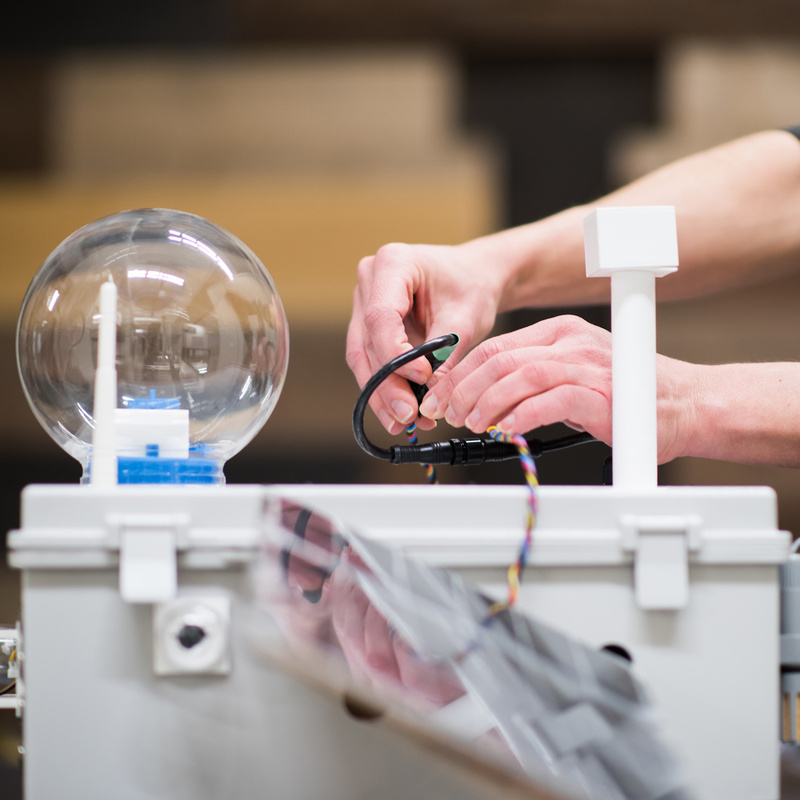 The machine itself was built by Coeur d’Alene maker space Gizmo, though U of I students continue to develop the artificial intelligence programming that makes it operate. Computer science students partnered with the Idaho Water Resources Research Institute at U of I and the Idaho Water Lab in Boise so the drone will be able to assist with a deep-water quality assessment of the lake. Beehner and senior Samantha Freitas worked on the device over the summer with the goal of setting up a navigation system. Catfish was connected to its researchers by a 2,000-foot-long fiber-optic tether during its maiden voyage. The team hopes to soon cut that tether and let the device maneuver on its own. Such expertise is essentially why the student experience can be so valuable, Rinker said. A company might be looking for some sort of automation and will look to the students to help with the computer coding to help with that process. Published in the fall 2018 issue of Here We Have Idaho.